This book’s overriding objective is to convey how to conduct Miranda evaluations and consultations. 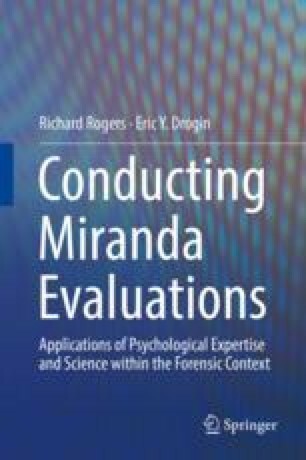 Nonetheless, Miranda-experienced forensic psychologists and psychiatrists carry additional professional responsibilities for the further education and training of practitioners who seek to broaden their forensic competencies, and, this book is also dedicated to that goal. Beyond specialized training, the dissemination of Miranda-relevant knowledge extends to stakeholders in the criminal justice system, directly involving law enforcement, officers of the court, and all organizations dedicated to upholding Constitutional rights. Whether the role in question is that of a forensic practitioner or researcher, we submit that advocacy for fairness and transparency is both a desired aspiration as well as a professional obligation. Such initiatives may be undertaken at local, state, and national levels. Their objectives may range from policy change at the agency level to legislative action at the state or national level. For such objectives to be fully realized, they must consider fair procedural safeguards for arrestees as well as respect for the professional roles of those charged with protecting our society. Finally, the establishment of Miranda research agenda is a forward-looking process of examining priorities for the next generation of Miranda knowledge and problem-solving. American Bar Association. (2010). Resolution 102B: Juvenile Miranda rights. Retrieved from http://www.abanet.org/crimjust/policy/midyear2010/102b.pdf. Hynes, C. J. (2010). Report on 102B: Juvenile Miranda rights. Retrieved from http://www.abanet.org/crimjust/policy/midyear2010/102b.pdf. John E. Reid and Associates. (2001/2002). Survey results. Retrieved from http://www.reid.com/success_reid/r_sresults.html.